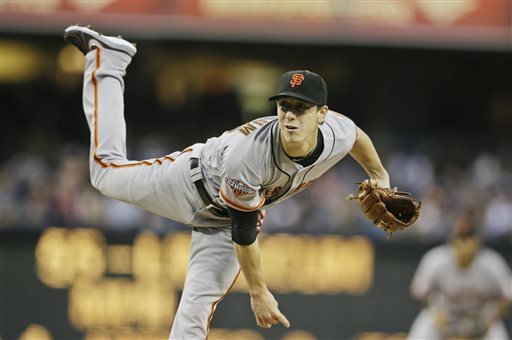 Tim Lincecum has accomplished a lot in his seven-year career with the San Francisco Giants. He’s a two-time Cy Young Award winner, a four-time All-Star. He was the NL All-Star starter in 2009. He was the Giants’ opening day starter 2009-2012. He started Game 1 of the 2010 NLDS, NLCS and World Series. He pitched the Giants to victory in the clinching game of the 2010 World Series. He’s a two-time World Champion. But one thing he hadn’t accomplished was pitch a no-hitter. So I understand how many Giants fans watching the last few innings of Saturday’s win over the Padres with nervous trepidation. However, I wasn’t one of them. I wasn’t nervous because I just didn’t think he could throw a no-hitter. Prior to Saturday, Lincecum had just five shutouts in his career and only eight complete games. None since 2011. So as Lincecum piled up the strikeouts Saturday, his pitch count continue to rise to more than 100 by the end of the sixth inning. At the pace he was on, it would take 153 pitches to complete nine innings of work. And as he had never thrown more than 142 pitches in a game in his career, it seemed as if time was not on his side. But he found a way. There’s something about July nights, the San Diego Padres, an unlikely pitcher that lead to no-hitters. You’ll remember when Jonathan Sanchez threw his no-hitter in July of 2009, he had just returned from being demoted to the bullpen when he no-hit the Padres. Jesus Guzman hit a bouncer behind the bag at third that Pablo Sandoval gloved and make a strong throw to first for the out to end the seventh. Alexi Amarista hit a sinking liner to right that Hunter Pence made a diving, rolling grab to end the eighth. The left the ninth, during which Lincecum struck out Headley and got Quentin and Yonder Alonso to fly out to Gregor Blanco to set off the celebration. It was a stirring, 148-pitch gem from Lincecum during a time when the Giants needed a spark the most. So let’s review the week as it is right, shall we? Monday, the Giants trail 4-2 in the eighth, but they get a two-run homer from Buster Posey in the eighth to tie it, and a pinch-hit RBI single by Brandon Belt in the ninth to win it, 5-4. Tuesday, the Giants trail 4-0 in the eighth, but they rally for two in the eighth and two more in the ninth (on a Belt two-run homer) to tie it and send it into extra innings. 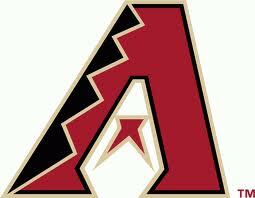 They lose it in 11, 6-4, when an error and wild pitch contribute to the Diamondbacks rally. Wednesday, the Giants trail 2-1 in the ninth when they tie it on a Brandon Crawford home run. But Arizona scores in the 10th to win it, 3-2. Friday, the Giants get a solid seven innings from Tim Lincecum, but can’t get him much offense and lose, 2-1. That’s four games, three one-run games, two extra-inning games, and 1-3 record. 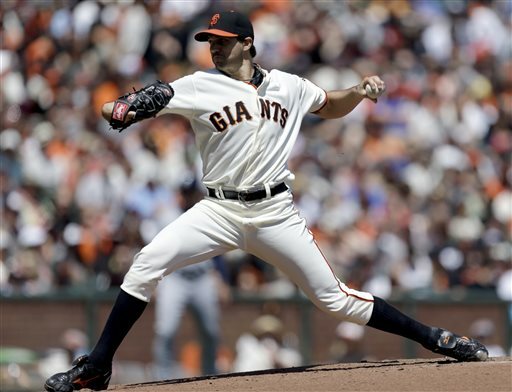 The Giants were due for a breather and figured to get one with Barry Zito on the mound. After all, the only two wins this season that didn’t require a save or walk-off hit featured Zito on the mound. 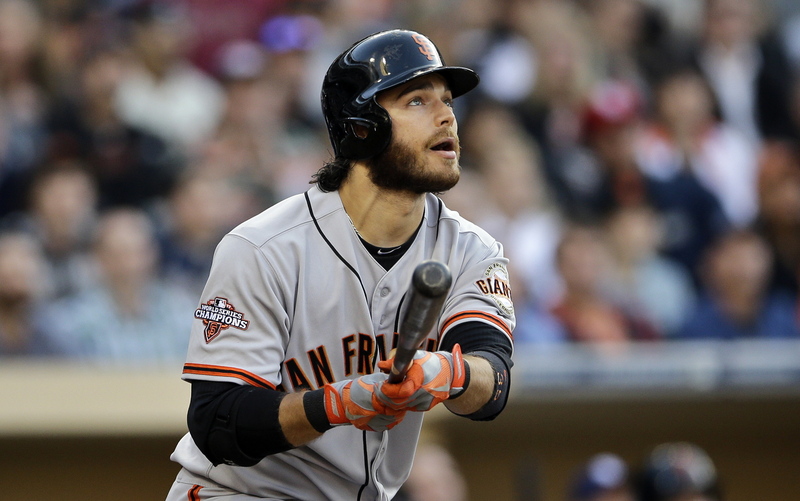 It looked that way as Crawford belted a three-run home run to help the Giants build a 5-0 lead through three innings. And then the big inning hit. But we can’t really blame Zito much. The Padres rally in the fourth was sparked by a two-base error by Andres Torres, when he completely whiffed a liner to left (and you thought Torres could only whiff at the plate). Six runs would score in the inning, although only one was earned to Zito. And if we’re looking to hand out blame, maybe we should send some Bruce Bochy’s way. We’ve seen these two-run or three-run rallies get ugly on Zito before. But I think the lefty’s recent run on success led the skipper to leave his pitcher in and see if he could work his way out of it. If this rally had come last season — any other season in a Giants uniform — Bochy would have had a quicker hook. Bochy needs to help Zito by going to get him during long innings. He loses his stuff when he asked to stay out there too long. The Giants still managed to reclaim the lead on Hunter Pence’s two-run triple, but the Padres rallied to tie it 7-7. It stayed that way in the eighth, ninth, 10th and 11th until the Padres put runners on first and third with one out. Nick Hundley hit a sharp one-hopper to Marco Scutaro for a potential inning-ending double play. But Scutaro could not corral it, and it went for a game-winning error. And now the Giants turn to Ryan Vogelsong on Sunday against Jason Marquis. The Giants don’t need a breather. A win would right now would provide a breath of fresh error after a third consecutive one-run loss. Well, Friday’s game in San Diego felt a lot like 2010 all over again. Tim Lincecum pitched a quality start (he gave up two runs in seven inning, striking out nine). But it didn’t matter because two runs were all the Padres needed to win this one. Even Luke Gregerson had a shutdown inning. The 2013 Padres are not the 2010 Padres. And the 2013 Giants are not the 2010 Giants. But for one night, it looked that way. The Giants wasted some early opportunities to score more runs, then the hitters went into shutdown mode. Angel Pagan opened the game with a single, stole second, went to third on a Marco Scutaro groundout and scored on a wild pitch in the first inning. Buster Posey then added a two out single. The Giants got two more hits in the second, but got nothing to show for it thanks to a double-play ball. In the third they put two on and nobody out, but the Padres’ Andrew Cashner retired Pablo Sandoval, Posey and Hunter Pence in order to end that threat. It started a string of 19 consecutive Giants hitters to be sent down. Needing some ninth-inning magic YET AGAIN, the Giants almost pulled it off. Posey lined a one-out single to right. Brandon Belt added a two-out single to put runners on first and third. But Brandon Crawford grounded to second to end the game. And the Giants wasted a nice outing from Lincecum. The Freak got into a funk in the second and third innings. He wriggled himself out of a jam in the second, thanks to a double play. And he almost did it again in the third. But a pair of two-out singles plated the Padres’ lone two runs of the game. Other than that, it was six more scoreless innings. That makes 29.2 innings thrown by Lincecum this season. All 12 earned runs he’s allowed have come in four innings. The other 25.2 have been scoreless. He lowered his ERA to 3.64. The loss makes three in a row for the Giants. But never fear, Barry Zito is here. The Giants have won 13 games this season. Seven of those wins have required a save. Two others were walk-off wins. The other two were 10-0 and 5-0 wins with Barry Zito on the mound. So with Zito pitching, we can all just sit back, relax and enjoy an easy win. The Giants went 3-3 last week, leaving them 12-7 for the season, 2md in the NL West , 1.5 games behind the Rockies. Tuesday: L 10-8 at Brewers. LP: Zito (2-1). HR: Crawford (2). Wednesday: L 4-3 at Brewers. LP: Casilla (1-1). Thursday: L 7-2 at Brewers. LP: Cain (0-2). HR: Crawford (3). Friday: W 3-2 vs. Padres. WP: Casilla (2-1). Saturday: W 2-0 vs. Padres. WP: Lincecum (2-0). HR: Sandoval (3). Sunday: W 5-0 vs. Padres. WP: Zito (3-1). HR: Posey (1). Hot-and-cold week for the Giants, swept in Milwaukee, sweeping at home. It really shows what flies balls do at Miller Park and what they do at AT&T. The Brewers hit 7 home runs in the series, compared to 2 by the Giants. Meanwhile, the Padres only managed one home run at AT&T, accounting for one of their two runs in the series. Monday: Diamondbacks (Miley 2-0) at Giants (Vogelsong 1-1), 7:15 p.m.
Tuesday: Diamondbacks (Corbin 2-0) at Giants (Cain 0-2), 7:10 p.m.
Wednesday: Diamondbacks (Kennedy 1-2) at Giants (Bumgarner 3-0), 12:45 p.m. The Giants will see a familiar face when the Diamondbacks come to town. Cody Ross signed as a free agent with Arizona last winter after playing last season with the Red Sox. Ross was the NLCS MVP in 2010 and played all of 2011 with the Giants. … The Giants went 9-9 against Arizona last season, but won 4 of the last 6 meetings. … Giants enter the season having won eight consecutive games against NL West opponents. … Arizona has lost 4 of its last 6 games. Friday: Giants (Lincecum 2-0) at Padres (Stults 2-2), 7:10 p.m.
Sunday: Vogelsong (1-1) at Padres (Richard 0-1), 1:10 p.m.
Petco Park has not been kind to the Giants in past season. But last year, the Giants won each series in San Diego, winning 6 of 9 there. … And that certainly gives Giants fans something to cheer as they generally outnumber Padres fans at Petco. … This year’s Petco will have a new look as the fences were brought in. … The Padres starting pitchers for this season is a bit in flux. The team currently only has four healthy starting pitchers after Tyson Ross went on the DL. He has not been replaced in the rotation, but the Padres could stick with their first four pitchers as Thursday is an off day for the Padres. … OF Carlos Quentin will have finished with his eight game suspension by the time the Giants come to town. … The Padres have won five games this season, four against the Dodgers. Tim Lincecum is 2-0. He was had a win-loss record two games over .500 in 2012. He was never one over .500. The best he was in 2012 was 2-2 after five starts. Tim Lincecum’s ERA is 3.97. The only time his ERA was that low in 2012 was after he retired the first batter he faced IN THE ENTIRE SEASON. The Giants won a game by shutout when Lincecum started. That only happen once in 2012 — on June 27 against the Dodgers. And the Giants are 4-0 this season when Lincecum starts. 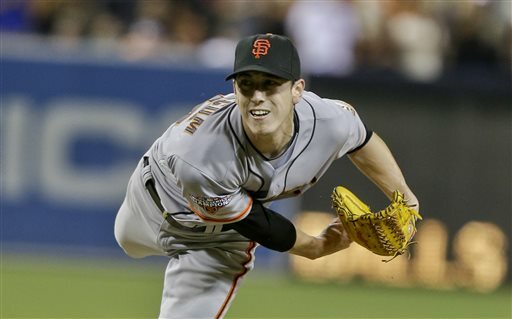 In fact, going back to September of last season, the Giants are 9-1 in Lincecum’s last 10 regular-season starts. So everything is right with Tim Lincecum, right? Well, we aren’t about to go that far, but Saturday’s win over the Padres was by far his best start of the season. He avoided the blow-up innings that hurt him against the Rockies and Cubs. And he didn’t put himself in dangerous situations by walking batters, like the seven he walked in his first start of the season against the Dodgers. 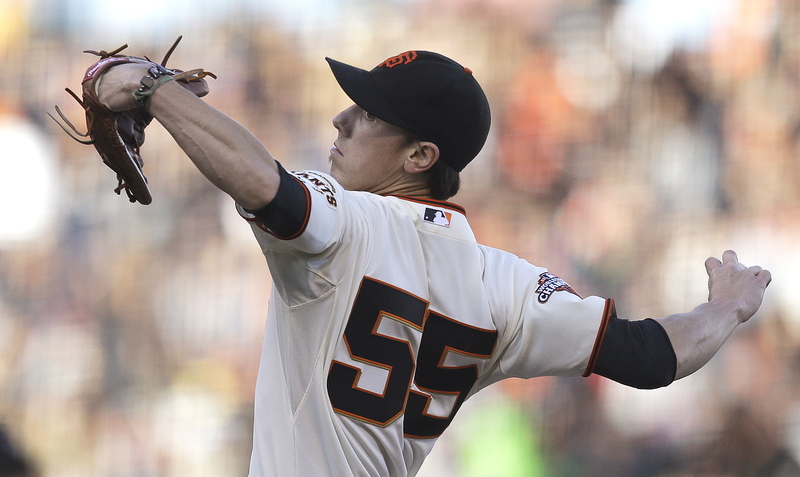 The bottom line for Lincecum on Saturday: 6.2 IP, 0 runs, 4 hits, 2 walks and 8 strikeouts. The only time Lincecum really got himself into a tight spot came in the third inning, when he gave up a lead-off single to Alexi Amarista. After striking out John Baker and getting Andrew Cashner out on a sacrifice, Lincecum walked Everth Cabrera before Will Venable loaded the bases on a swinging bunt. A blow-up inning looked possible when Chase Headley came to the plate and worked the count to 3-1. Lincecum ran a fastball in on Headley, who may have helped Lincecum out by swinging at the pitch. He grounded out to second to end the inning. Lincecum set the side down in order in four of the seven innings he started. He stretched to scoreless streak to 10.2 innings. In fact, he has not allowed an earned run in 19.2 of the 22.2 innings that he’s pitched all season. Has Timmy returned to his former self? Too early to tell. His next start will come next Friday against these same Padres in San Diego, but we may not get a real good answer until his next start which comes against the Diamondbacks in Arizona, where trouble seems to find him. But he was on Saturday, and the Giants needed him to be. They only mustered four hits and scored only when Pablo Sandoval sent a two-run home run to right in the fourth. The Giants went 6-1 last week, leaving them 9-4 for the season, 1st in the NL West , 0.5 games ahead of the Diamondbacks and Rockies. Monday: W 4-2 vs. Rockies. WP: Bumgarner (2-0). HR: Pence (3). Tuesday: W 9-6 vs. Rockies. WP: Casilla (1-0). HR: Crawford (1). Wednesday: W 10-0 vs. Rockies. WP: Zito (2-0). Thursday: W 7-6 vs. Cubs. WP: Vogelsong (1-1). Saturday: W 3-2 vs. Cubs. WP: Bumgarner (3-0). Sunday: W 10-7 (10) vs. Cubs: WP: Kontos (1-1). The Giants continue to get fat against the Rockies and Cubs. If not for a couple of wind-blow balls on Friday, leading to Sergio Romo’s first blown save of the season, the Giants might have had a perfect week. On the other hand, the Giants also had wins when they rallied from being down 6-2, 5-0 and 4-1. Giants are still waiting for Buster Posey and Brandon Belt to start hitting, and the starting rotation has had some mixed results. So room for improvement. In Week 3, the Giants face two teams they had success against in 2012 and that are struggling early in 2013. Tuesday: Giants (Barry Zito 2-0) at Brewers (Peralta 0-1), 5:10 p.m.
Wednesday: Giants (Ryan Vogelsong 1-1) at Brewers (Lohse 0-1), 5:10 p.m. The Giants went 4-2 against the Brewers in 2012. … The Brewers are struggling to score runs, and the issue is hitting in the clutch. The Brewers rank 10th in the NL in team hitting (.252) but 14th in runs scored (36). … Miller Park is the perfect setting for Posey to get rolling. He loves, loves, loves to hit in Milwaukee. He is a career .500 hitter (12 for 24) with 6 HRs and 15 RBI in seven games there. … There are three starting pitchers in the NL who have yet to allow an earned run — Atlanta’s Paul Maholm (20.1 IP), Jake Westbrook (15.2 IP) and Barry Zito (14.0 IP). … But Miller Park has not been kind to Zito. He is 0-4 there with an ERA of 7.67. But those starts came before Zito’s renasance that started last August, during which the Giants have won 16 consecutive Zito starts. Friday: Padres (Volquez 0-3) at Giants (Madison Bumgarner 3-0), 7:15 p.m.
Saturday: Padres (Richard 0-1) at Giants (Barry Zito 2-0), 6:05 p.m.
Sunday: Padres (Stults 2-1) at Giants (Ryan Vogelsong 1-1), 1:05 p.m. The Padres have always been a team that tends to give the Giants fits in recent seasons. But the Giants went 12-6 against the Friars in 2012. … The Giants will not see Carlos Quentin in this series. The Padres outfielder dropped his appeal of an eight-game suspension for charging the Dodgers’ Zach Greinke last week. Good news for the Giants; Quentin has 5 HRs and 12 RBI in 34 games against the Giants. … But the Padres should get 3B Chase Headley back after missing the first couple of weeks of the season with a broken finger sustained during spring training. … Padres’ Volquez has an 11.68 ERA in three starts this season. … The Padres’ team average of .238 is fourth-worst in the NL.